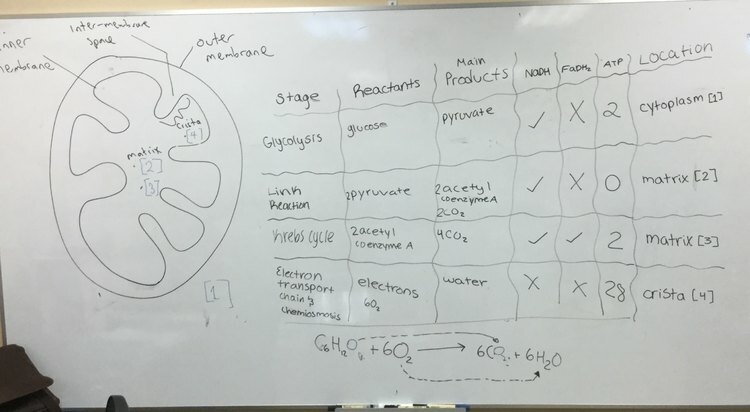 Outline that cell respiration involves the oxidation and reduction of electron carriers. State that phosphorylation of molecules makes them less stable. 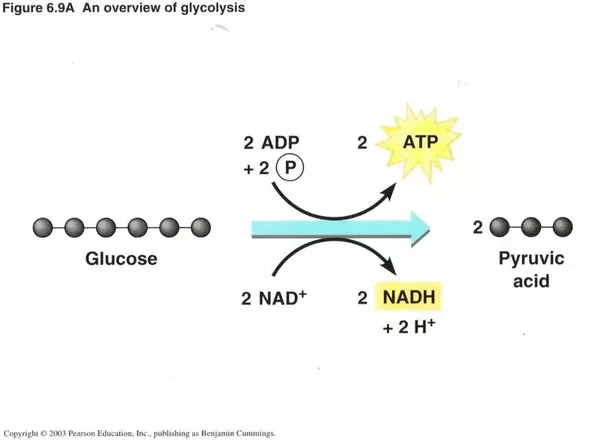 Outline that in glycolysis, glucose is converted to pyruvate in the cytoplasm. Explain how glycolysis gives a small net gain of ATP without the use of oxygen. Explain how, in aerobic cell respiration, pyruvate is decarboxylated and oxidised to form acetyl coenzyme A in the link reaction. 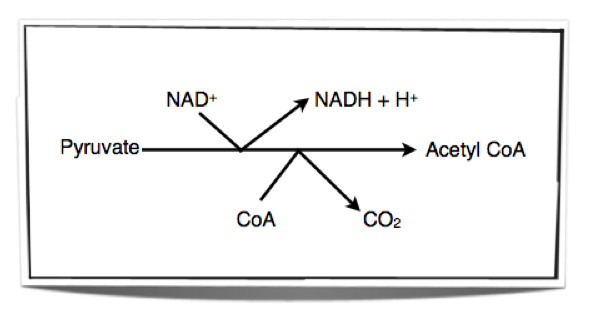 Analyse diagrams of the pathways of aerobic respiration to deduce where decarboxylation and oxidation reactions occur. Explain how, in the Krebs cycle, the oxidation of acetyl groups is coupled to the reduction of hydrogen carriers, liberating carbon dioxide. State that energy released by oxidation reactions is carried to the cristae of the mitochondria by reduced NAD and FAD. Explain how the transfer of electrons between carriers in the electron transport chain in the membrane of the cristae is coupled to proton pumping. 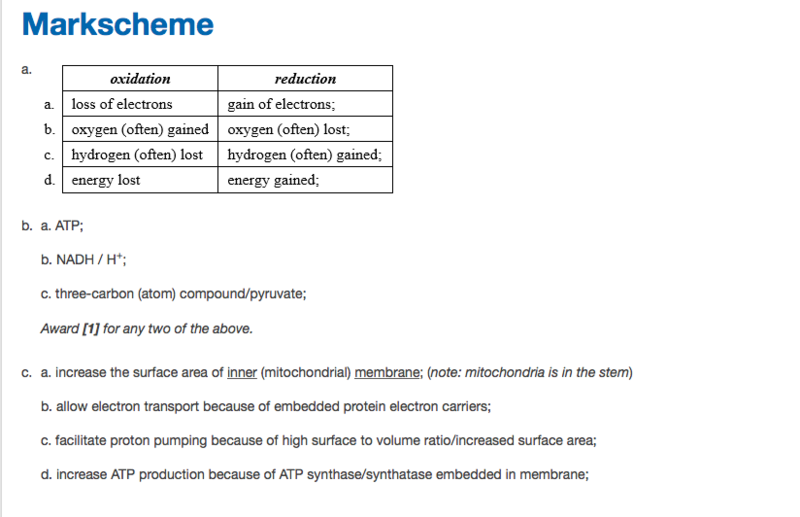 Explain how, in chemiosmosis, protons diffuse through ATP synthase to generate ATP. Outline that oxygen is needed to bind with free protons to form water to maintain the hydrogen gradient. 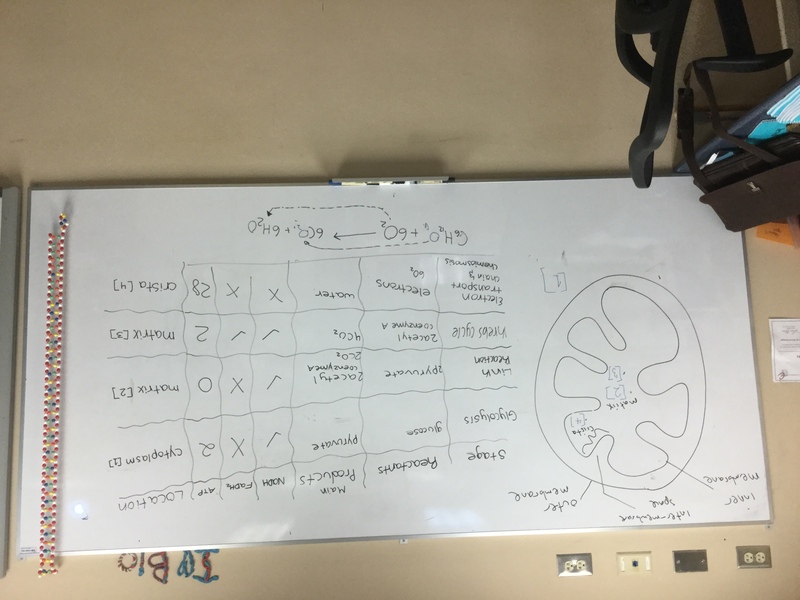 Explain how the structure of the mitochondrion is adapted to the function it performs. Outline that electron tomography can be used to produce images of active mitochondria. Annotate a diagram of a mitochondrion to indicate the adaptations to its function. Objectives: Three introductory ideas for respiration. The steps of respiration (what you need to understand). Adaptations of mitochondria. FAD (Flavine adenine dinucleotide): an electron carrier too, becomes FADH2. NAD and FAD are similar, but you only find FAD in the krebs cycle while NAD is found in many stages. Electron transport chain and chemiosmosis “send the electrons along a chain of proteins, that release their energy. Use the energy to make ATP by pumping protons into a high concentration, and letting them flow out through a special protein channel”. At the end the electrons are accepted by oxygen, along with 2 hydrogen ions, to make water. Basically, glucose reacts with oxygen (and loses electrons in the process). Glucose is therefore oxidised. But not all at once. That would release too much energy too fast (like a fire). Oxidation happens slowly, in a number of steps. This allows for more metabolic control. The electrons from glucose (resulting from oxidation) and the intermediate steps of glucose need to be transported to the inner membrane of the mitochondria (cristae). Also a lone electron is too reactive to be left unattended in a cell. Therefore they need electron carriers. NAD and FAD are the electron carriers. NAD and FAD are electron carriers, BUT they don’t just carry electrons, they carry hydrogen (a hydrogen atom has 1 electron and 1 proton). 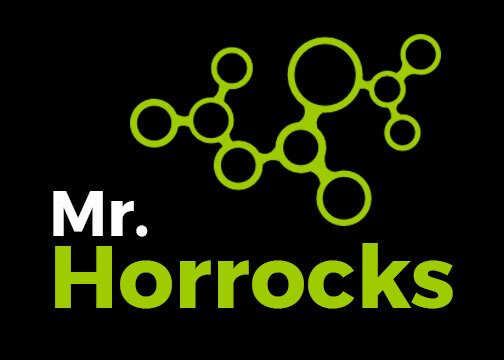 The proton is needed in chemiosmosis. Decarboxylation is the removal of carbon dioxide. Glucose is a 6C molecule. You need to make 1C carbon dioxide. How do you do that? Well first you split it in half (glycolysis), and then you tear off the carbon atoms one at a time (Link reaction and then krebs cycle), until you only have 1C molecules in the form of carbon dioxide. The oxygen in the carbon dioxide by the way, is already in glucose (C6H12O6). The oxygen that reacts is used to make water, at the end of the fourth stage of respiration (electron transport chain / chemiosmosis). Now for the stages themselves. the splitting of glucose (6C), using phosphorylation (which weakens bonds), to form pyruvate (3C molecule). You don’t need to know the intermediate stages. You have to invest two ATP to weaken the bonds (that’s the phosphorylation part). It is worth it though as you get 4 ATPs back from the energy released when the bond breaks. At the end of gylcolysis you get pyruvate. Pyruvate can be easily changed into lactic acid, in fact in anaerobic respiration in humans, you only have glycolysis (which is why only get 2 ATP instead of 38 ATP in aerobic respiration). note for the image: pyretic acid is equivalent to pyruvate. The link reaction doesn’t make any energy (ATP). It’s more like a connecting reaction (hence called the ‘link’). It is still important though as pyruvate (the reactant) is oxidised, and decarboxylated. As it is oxidised, you reduce NAD and also gain two CO2 (why two? there are two pyruvates and they are both decarboxylated). Overall the link reaction is the decarboxylation and oxidation of 2 pyruvates (3C) , and the combination with coenzyme A, to form 2 molecules of acetyl coenzyme A (2C). a cycle of reactions where acetyl is decarboxylated and oxidised, to form carbon dioxide. It takes two turns of the cycle to break down glucose. This is because there are two molecules of acetyl coenzyme A (which came from the two pyruvates). Why a cycle? It would be simpler to just decarboxylate acetyl, but actually the activation energy is too high and it works better if you combine it with a 4 carbon molecule, and then decarboxylate twice. acetyl 2C + 4C molecule ——) 6C molecule —————-) 5 C molecule ———) 4 C molecule used again! why? Because to go from ADP to ATP you are adding phosphate (check 2.7 if you have forgotten this), and you do if with the energy from oxidation reactions. The energy is used to make ATP, by pumping so many protons into a tiny space that they flow out through a specialised protein channel that makes ATP (a bit like water flowing through a turbine in a hydroelectric power plant). 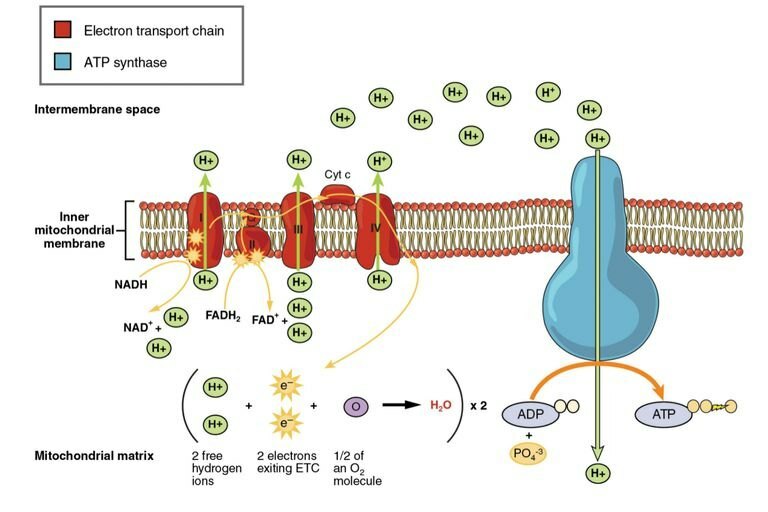 In the electron transport chain, a series of electron carriers (these ones don’t move, like NAD and FAD, they are stuck in the lining of the inner membrane of a mitochondria) that pass electrons between them, releasing energy for chemiosmosis. Energy is released because the electrons go to lower energy states as they pass from one carrier to the next (a bit like a line of people passing a hot potato, the potato gets cooler as it goes from one person to the next) The electrons are finally accepted by oxygen, with H+, to make water. Oxygen is the final electron acceptor in the electron transport chain. So this is where the water comes from as a product of respiration ! Chemiosmosis: is the buildup of electrons and subsequent release through a protein channel from hight to low concentration, to generate ATP. Pumping them into the inter-membrane space, using the energy released by the electrons (in the electron transport chain). They reach very high concentrations. 2. Channels for hydrogen ions open in the cristae, and the highly concentrated protons (hydrogen ions) are allowed to flow out. As they do so, they drive the production of ATP from ADP and P.
The inner membrane is folded to form the cristae. This increases the surface area for the electron transport chain and chemiosmosis. The intermembrane space is really small. This makes it easier to build up really high concentrations of hydrogen ions to drive chemiosmosis. These features have been understood by using tomography (building a 3-dimensial picture by overlaying 2-D images from a transmission electron microscope). Mitochondria also have their own DNA (a ring), and their own ribosomes (70S). Read about the endosymbiotic theory again (1.6 origin of cells).